Relationships can be challenging, but infidelity can create a hardship that causes the relationship to collapse. After discovering that your partner has been cheating, you may begin to question yourself and wonder how you missed the warning signs. Infidelity can create a rift between couples on so many levels, and depending on how it's discovered, that rift can seem almost insurmountable. However, cheating doesn't have to be the end of your relationship. Many couples have faced infidelity and gone on to thrive in their relationships. Here are a few steps to take after the indiscretion has been discovered and you've decided to stay with your partner. 1. 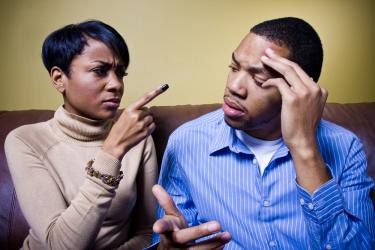 Communicate – After your partner has been unfaithful, you should ask them why they strayed? It seems like a simple step but it's often skipped. After all, the truth can hurt. But its best to know the reasons so those issues can be addressed. Wait until your partner is ready to open up and reveal this information to you. Unfortunately, in some cases, the answer to this question will never come. Poor communication can make it difficult to repair a damaged relationship. 2. Don't Blame – If you've decided to stay that should also mean you've decided to forgive. Staying in the relationship, without forgiving, is a losing endeavor. Forgiving doesn't mean you have to forget what happened. Discovering the motivation behind the infidelity should help ease the road to forgiveness. Time is a fundamental element in achieving this crucial step. 3. Seek Counseling – Getting advice from a qualified third party can be helpful and may accelerate the healing process. Counseling can be beneficial if taken alone or as a couple. If you are religious, you might consider getting religious based counseling. Choosing a counselor is a personal decision and selecting the right person is something that should be discussed between you and your partner. If you're unable to seek professional counseling, you might find success by discussing the matter with a mentor or any confidant you feel comfortable sharing the facts with. 4. Spend Time Alone – Sometimes the best way to reconnect to someone else is to reconnect to yourself first. Revisit an old hobby or start a new one. Reflect on your life and determine if your goals still align with the relationship. If not, you have to decide if you are ready to take steps to move away from the relationship permanently. 5. Plan a Date – Reconnecting with your partner means spending time with your partner. Plan a date night, for an added touch, try recreating the very first date you and your partner shared. This is a great time to reminisce about memorable moments in your relationship. Take a stroll down memory lane and think about the reasons you decided to enter the relationship in the first place. Remembering good times can help you get through the bad times. 6. Take a Romantic Getaway – Regaining those wonderful feelings toward your partner may take more than just a date night. If so, this is the perfect time to go on a couple's retreat. Another option is to take a day trip if you can't take a full vacation. Leave in the morning, spend a whirlwind day on a mutually enjoyable activity and return home by nightfall. 7. Renew Your Vows – You don't have to be married to take vows. However, if you are married, this is an excellent time to renew your vows and show your commitment to the relationship. This act makes a very strong statement to both your partner and the world by showing the level of dedication you have for each other. The support of friends and family can propel you forward in your relationship and smooth the way to forgiveness. Of course, these steps assume you are fully committed to staying and repairing the relationship. Infidelity is a serious matter and it can definitely lead to a break up but it doesn't have too. Thousands of couples overcome unfaithfulness and go on to have healthy and happy relationships and so can you. Time, patience and forgiveness are key elements to surviving and thriving after the infidelity. For the greatest success, make sure both you and your partner are truly able to bring these elements to the forefront if you are trying to tackle the issue of infidelity in your relationship.